Engineered to refuel devices up to 4x faster than conventional charging. QC3.0 VS QC2.0: + 38% efficiency ; + 27% charging speed; - 45% heat. Harness the full power of USB-C technology to charge your device faster. Provides 5V/3A output, which is great to charge Nexus 6P, Lumia 950/ 950XL, Nokia N1 and other Type-c devices. Tuned to support healthier battery function and faster USB charging speeds, smart chip intelligently adjusts power output to match the unique charging needs of all your USB powered gear. With up to 2.4A of dedicated adaptive output per USB port, your devices will each receive the safest maximum recharge rate possible. The built-in smart security chip brings temperature protection, output over-current protection, output over-voltage protection, output overload protection, output short circuit protection, surge protection, automatic reset protection, under-voltage protection. For you and your devices safety. 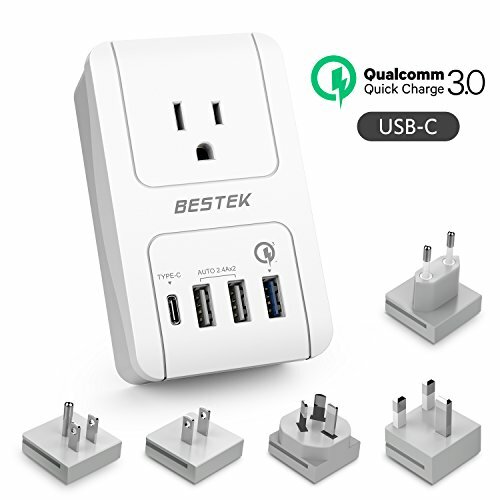 Compact size: 4.2 x 2.6 x 1.4 inches only with 5 international adapters ( US/UK/AU/EU/JP adapter) support outlets in North America, United Kingdom, Continental Europe, Australia, Japan, China etc, more than 150 countries all over the world. • We provide a 18-Month warranty and friendly, easy-to-reach support.